Measuring just 3.5 inches long, an inch wide, and less than a quarter of an inch thick, the AmpStrip Heart Rate Monitor is an ideal replacement for bulky, strap-bound monitors. 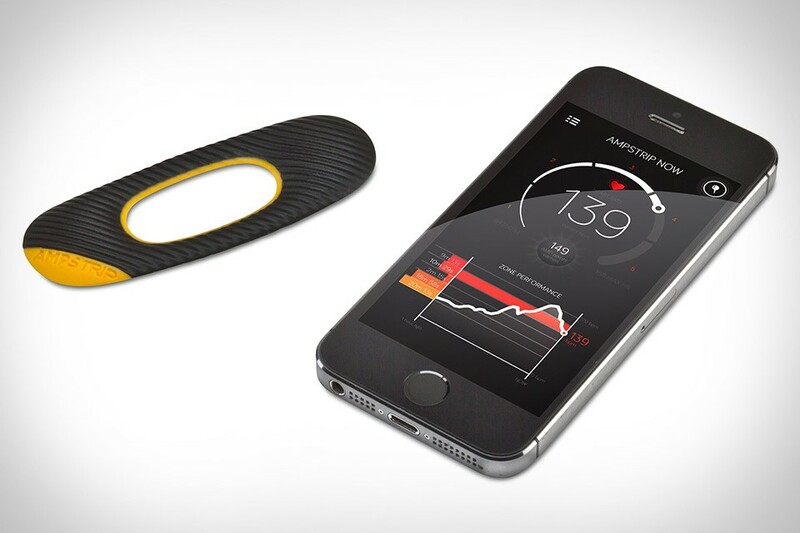 The discrete gadget sticks to your chest using hypoallergenic medical-grade adhesives, and incorporates a single-lead ECG sensor, an accelerometer, and a Thermistor to deliver plenty of fitness-related info to your phone via Bluetooth. Yes, a normal scale can tell you your current weight. But as most people know, weight is only one of several relevant metrics when it comes to your well being. The QardioBase Smart Scale gives you a broader view of your fitness goals, by measuring your BMI, body fat, muscle, water and bone composition in addition to your weight. Its sleek design looks great in any bathroom, and since it automatically distinguishes you from your family, it's able to sync your stats with your iPhone, iPad, or Android device over Wi-Fi or Bluetooth. And don't worry if you don't feel like looking at your phone right away — the scale shows a smiley face or frown face in its center as soon as you step off, giving you an at-a-glance update on your fitness goals. Smartwatches are increasingly becoming the de facto way to track your activity. But what if you like the watch(es) you already have? The Jawbone Up Move is an affordable alternative. This waterproof, clip-on activity and sleep tracker pairs with your phone using Bluetooth — just like it's "smarter" brethren — for tracking and advice from the Up app's Smart Coach, while 12 on-board LEDs give you an at-a-glance look at your daily progress. And since it's available in five colors, you should be able to find one that fits in with your lifestyle. Packed full of sensors, the Jawbone Up3 isn't concerned about incoming notifications from your phone. It is concerned with your health and fitness. To keep track of it, it uses a new tri-axis accelerometer, bioimpedance sensors, skin sensors, and ambient temperature sensor to track your resting heart rate, sleep stages, and activities and workouts, with more metrics promised in future updates. To make sense of all this data, it syncs with the Up App and its Smart Coach that keeps track of your progress and delivers personalized guidance. And thanks to a water-resistant body and up to a full week of battery life, there's little reason for you to take it off. When it comes to running, logging laps on a treadmill is rarely better than going outside. The Landice L8 Executive Treadmill is a notable exception. It features a four horsepower motor capable of speeds up to 12 mph, a one-inch thick reversible deck that can be elevated by 15% and sports a VFX Shock Absorption System that makes it five times softer than grass, an integrated cooling fan, stereo speakers, and water bottle holder, an included wireless heart rate monitor, and a nine-inch touch screen with iPod/iPhone connectivity to make sure your runs are never boring, even if you're just moving in place. A gadget that never requires charging might sound like a pipe dream, but if it is, the Misfit Flash is that dream come true. Powered by a coin cell battery that lasts up to six months, this sleek tracker uses a 3-axis accelerometer to monitor your movement and sleep, measuring steps, calories burned, distance, sleep quality, and duration. It transfers all this data to your phone via Bluetooth, providing you with updates via a halo of lights on the front that show your progress toward your goal while also telling the time. It's also waterproof, wearable in several different ways, and, oh yeah, it's less than half what most fitness trackers cost. At this point, you might have some trouble being bothered with yet another wearable fitness tracker — they're ubiquitous, with different options popping up nearly every other month. So what makes the Spire Health Tracker any different from the herd? For starters, it's not just about tracking your movement and sleep (though it definitely does that). The Spire focuses mainly on tracking your breathing, giving you real-time updates on your mood to help keep your psyche in check. Add on the fact that it looks great, charges wirelessly on its gorgeously-designed pedestal, and has a beautiful, intuitive app, and you get a tracker that's worth a second glance.